Mr and Mrs J. Fletcher Jones, of 121 Mount Road, New Brighton, received official notification on Tuesday of the death from wounds of their eldest son, Lance-Corpl. William Fletcher Jones, which occurred in Flanders on November 9th. He had just turned 17 years of age when he joined the 4th West Lancashire Royal Field Artillery (Howitzer Brigade) in August 1914. He was drafted to Ypres in 1915 with the 2nd Canadian Division of which they formed part of the Artillery. Sometime afterwards the 55th Division was formed with which they were embodied, and he was with the famous Division through the battles and hard fighting they experienced. After the battle of the Somme, he became attached to the Royal Engineers, having during the quiet periods made a special study of signalling, coming through the various examinations with the highest honours, and at the time of his death he was away on special duty in charge of the Brigade wireless. Lance-Corpl. Jones was educated at Vaughan Road School, and for several years was a member of the 4th Wallasey (Emmanuel) Scouts, in which he took a most active and enthusiastic interest. Much sympathy has been extended to the parents in the loss of a gallant young life, just at the close of the fighting after 4 1/2 strenuous years." William Fletcher Jones was born on 7 May 1897, the eldest child of John and Alice Jones of New Brighton, Cheshire. As his inscription records, Jones enlisted on 8 August 1914, four days after the outbreak of war. He died of wounds two days before the end. Jones was 17 and three months when he enlisted and 18 and four months when he disembarked in France on 29 September 1915. He was therefore underage. Soldiers were meant to be 19 before they could go to the front - unless they had their parents signed permission. It's not possible to tell exactly when Jones was wounded but he is one of only six First World War soldiers buried in Chercq Churchyard. All six soldiers died on either the 8th or 9th November, casualties of the crossing of the River Escaut/Scheldt during that night when the 166th Brigade reported heavy enemy machine gun fire as they began to cross the river. AND A STRAIGHT WHITE MAN"
What a difference a hundred years makes: our understanding of the words 'straight' and 'white', especially in relation to men, has changed radically since Private Mann's officer described him as 'a straight white man'. To be straight meant to be honest and straightforward, and to be a white man meant to be decent and trustworthy. "A good brave lad who has been four months at the front and he is willing and hard working." Honesty may not have been his strong point but his seniors all thought well of him. Thomas Mann enlisted again in September 1917. This time in the 7th Battalion The Buffs (East Kent Regiment). The battalion were involved in the 3rd Ypres Campaign in the autumn of 1917. In the spring of 1918 they were in the eye of the storm of the German offensive at St Quentin, and then they were back at the front again for the final push across both the St Quentin Canal and the River Selle. "During night our patrols active and a number of enemy machine guns located. A patrol under 2/Lt Gerard endeavoured to capture an enemy MG post but came under heavy fire. Bombs were thrown and the gun was afterwards inactive." Was this how Private Mann met his end? It is estimated that there was something in the region of 250,00 underage soldiers serving in the British army at the beginning of the war. Soldiers were meant to be 18 before they could enlist, and 19 before they could serve at the front. However, prior to the introduction of conscription you didn't have to be able to prove your age you just had to declare it. If you looked 18 the army took your word for it. Much has been written about recruiting sergeants turning a blind eye to the underage because they got a bonus for every man they enlisted. But the fact of the matter was that the army wanted men and not weaklings. Soldiers had to be able to carry their packs and march long distances. If you looked old enough and strong enough the army took your word for it. I don't know the circumstances Mann's discharge. Did his parents track him down and tell the authorities how old he was or did Thomas himself ask to be released when faced with the reality of war? Thomas Harry Mann was the eldest son of Thomas Henry Mann, a printer's machine assistant from Walworth in south east London, and his wife, Charlotte. Born in January 1899, Albert Knowles would have been fifteen and a half in July 1914. By implication therefore he joined up immediately on the outbreak of war. in August 1914. He was far too young. In theory you had to be eighteen before you could join the army and nineteen before you could serve abroad but in practice, in the early days of the war, if you said you were nineteen, and looked nineteen, the army took your word for it. Much is made of recruiting sergeants wilfully turning a blind eye to obviously underage boys but in fact, the army didn't want weaklings. : you needed to be able to march long distances, carrying your own equipment. But as I said, if you looked nineteen the army took your word for it. Knowles obviously managed to convince the authorities. His medal card shows that he went to France in September 1915 when he would have been just over sixteen and a half. It was January 1918 before he became nineteen, by this time he had been in the army for over three years. In March 1918 his eldest brother, Ernest, serving with the 3rd Battalion Grenadier Guards, died of wounds. Six months later, on 12 October, Albert was killed as the 16th Battalion King's Royal Rifle Corps tried to cross the River Selle. For all that the end of the war was only a month away, for all that the Germans were already putting out peace feelers, their soldiers were still fiercely resisting allied attacks so that by noon on the 12th the 16th Battalion, which had been charged with taking the line of the Le Cateau-Solesmes railway and the surrounding high ground, had been forced to withdraw 'disorganised' with very high casualties. Albert Knowles may have deceived the army authorities about his age but his mother put that right on his headstone. There's a sense of pride in her choice of words, not so much pride in his deception but in the fact that even though he was only fifteen he had wanted to do his duty, and that he continued to do it "till death". There is no inscription on his brother Ernest's headstone. Thring's Horse took part in the suppression of the Maritz / Boer Rebellion after General Maritz allied himself with the Germans and declared that "the former South African Republic and Orange Free State as well as the Cape Province and Natal are proclaimed free from British control and independent". The war, Maritz claimed, was South Africa's chance to free itself from British control and become independent. It won't surprise you to learn that Norman Cheetham's mother chose his inscription; her description of him has such a proudly informal, affectionate tone. She spoke no less than the truth. There's a photograph of Cheetham on the Australian War Memorial site and he is indeed a good looking boy. It was his mother too who filled in the form for the Roll of Honour of Australia. Here she states that he was precisely 20 and 6 months old when he was killed on 31 July 1917. This means that he can't have been 19 when he embarked from Australia on 6 July 1915 as it says on the embarkation roll. He must have been only 18 and six months. If you look at the information at the bottom of the photograph you can see that it says that at 19 he was underage. Well he wasn't, at 19 you could serve abroad without parental permission, but not at 18, which was his true age. However, there is also a copy of a note from his parents: "Dear Norman, Father, mother give consent to enlist. We commit you to God's care." His parents' comfort was that he had given his life for others. How did people rationalise this? According to this argument, the Germans, and their allies the Ottoman Turks, were a threat to the stability and safety of the civilised world. They were murderous barbarians. 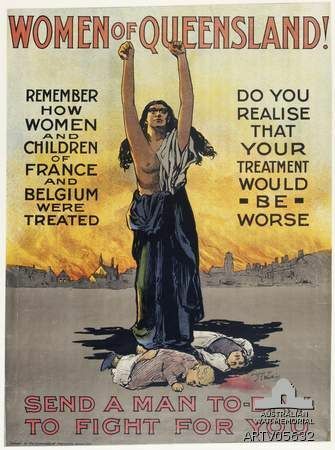 This poster, warning the women of Queensland that the Germans would treat them worse than they had treated the women of Belgium shows the thinking. It also demonstrates how Mrs Cheetham was able to console herself with the idea that her son had given his life for others. Leslie McMurdo was underage when he was killed by a sniper - born in April 1900, he was only seventeen. But he had been determined to fight, so determined that when his attempt to join up in South Africa at the age of 16 failed he stowed away to Australia where he added two years to his age and claimed that he'd already undergone 121 days military training. The Australians accepted him on 21 September 1916, he embarked from Sydney on 23 December 1916, arrived in France via Britain on 4 August 1917, joined the 12th Rifle Company, 31st Battalion Australian Infantry on 24 August and was killed in action one month and two days later in the Battle of Polygon Wood. Leslie McMurdo was the eldest of his parents' seven children. He was born in Stockton-on-Tees, Durham. The family emigrated to South Africa sometime between 1909 and 1911. His father, Thomas McMurdo, died in November 1914 so it was his mother who was his next of kin. She filled in the circular for the Roll of Honour of Australia and interestingly, she backs up her son's story claiming that he was 18 when he died. But the British records don't lie and they show that he was born in the second quarter of 1900. She also states that he came to Australia when he was 16 - that bit is true - "to go farming with Mr F.A. Sheppard ... but I do not know if he would have any other information to give you". I can't tell whether that is true or not but the speed with which he gets into the Australian army would indicate that he didn't have much time to do much farming. It's Mrs McMurdo who tells us of the manner of his death"
"After the Battle at "Polygon Wood", whilst attending a wounded comrade, 200 yards out in "No Man's Land, was shot though heart and left eye." His body was found in an unmarked grave in March 1920. Is this just an ordinary gravestone inscription or are we meant to hear an echo of the words of the second verse of Canada's most famous war poem? I hear an echo of the poem; loved and was loved rather than loved and were loved because we're only talking about one man not all the dead. Eighteen-year-old Phillips Welch - some sources spell his first name without the 's', others spell his surname Welsh not Welch - enlisted on 3 January 1916. Born on 11 March 1899, he was two months short of his seventeenth birthday. This means that when he was killed in action on 10 April, he was eighteen and one month. He probably didn't confess to being so young when he joined up as he would have been too young to serve abroad. No doubt he could convince the authorities he was older since he was 5' 9'' , tall for those days, with a 38" chest and a 4" chest expansion. All this information is contained in a soldier's attestation form. Welch served with the 7th Company Canadian Machine Gun Corps and was killed in action on the second day of the fighting at Vimy Ridge. William Henry Brunsdon enlisted on 30 January 1915. He was just 17. To serve in the British army you had to be 18, and to serve abroad, 19. However, until the introduction of conscription in January 1916 you did not have to prove your age you just had to state it. If you looked 19 the army believed you. If you were 19 and didn't look it they probably didn't believe you. The army wanted men not boys. You needed to be able to carry your pack, which weighed at least 25 kg, rising to 41 kg as the war went on, and march long distances carrying it. This was the reason for the age qualification, not for any child protection reasons. This is why the navy accepted boys at 16 - you didn't need to be able to march carrying a pack. Brunsdon's medal card indicates that he was entitled to the 1915 Star having gone to France in December 1915, still only 17. In the autumn of 1916, after the introduction of conscription and the death of many underage soldiers in the Somme campaign, the army agreed to remove them from the front line - if they wanted to go. Brunsdon obviously didn't. He was killed in action near Ypres on 23 July 1917. This is surely no dream, the vision of your seventeen-year-old son lying wounded on the battlefield, calling in vain for help, is the stuff of nightmares not dreams. Lyell Pocock was wounded on 15 October during the Battle of Pozieres and died the same day. His parents never instituted a Red Cross Wounded and Missing Enquiry Bureau search so there is no record of the circumstances of his death. Mr and Mr James Pocock were haunted by their imaginings and managed to find the words of a song to represent them. Whilst the announcements of his death in the local Bendigo papers describe Lyell as 18, James Pocock was very precise when he filled in the circular for his son's entry on the Roll of Honour of Australia: his son was seventeen and six months. This means that he was sixteen and five months when he enlisted in September 1915, and still sixteen when he embarked from Australia on 25 January 1916. I am writing on behalf of a gallant youngster in my company, and I believe known to you. His age is I suspect not more than 17 now, and he has been out some while, and though he is an excellent sturdy youngster his nerves are obviously not strong enough for the racket of this existence, which is now-a-days more violent than usual. The point therefore is that his parents or guardian can write and claim him back, by producing a birth certificate, only he himself is apparently entirely in the dark as to who his guardian is - he has of course no parents. So I wonder if you could make representations in the right quarter and collect a copy of his birth certificate and get the thing done: he isn't a fellow I want to lose, but I feel it partakes rather of cruelty to animals to keep him out here just at present." The 'gallant youngster', Private Hugh Aubrey Cockerton, died of gas poisoning on 2 October before anything could be done to send him home. His father had died in 1907 and although his mother was still alive, she died four months later in February 1917. A Miss Cockerton chose his inscription, perhaps one of his several sisters, making sure that from now on there should be no mistake about his age. An elder brother, John Richard William Cockerton, was killed in action on 9 November 1914 and is commemorated on the Le Touret Memorial. I found this inscription in Trefor Jones' On Fame's Eternal Camping Ground: a study of First World War Epitaphs in the British Cemeteries of the Western Front. He notes that despite its appropriateness he has only seen it used this once on a war grave cemetery headstone. I agree with him about its appropriateness and I too have never seen it used anywhere else. David Best was a seventeen-year-old boy serving with the Tyneside Scottish when he died of wounds received on the Somme. "I see a beautiful city and a brilliant people rising from this abyss, and, in their struggles to be truly free, in their triumphs and defeats, through long years to come, I see the evil of this time and of the previous time of which this is the natural birth, gradually making expiation for itself and wearing out. I see the lives for which I lay down my life, peaceful, useful, prosperous and happy, in that England which I shall see no more. It is a far, far better thing that I do, than I have ever done; it is a far, far better rest that I go to than I have ever known." George Benjamin Johnstone Stoddart was 18 and nine months when he died on 4 March 1918. Born on 21 July 1899 he was therefore just 15 when he enlisted on 1 September 1914, and still 15 when he went to France as a cavalry machine gunner with 6th Dragoon Guards on 23 May 1915, thus qualifying for a 1915 Star. His medal card indicates that he was discharged on 15 January 1915. However, it doesn't look as though he was discharged because he was discovered to be underage but because he received a commission in the Royal Field Artillery. The 25 January 1918 edition of 'Flight' lists Stoddart's name as among those being confirmed in the rank of Flying Officer, and then three months later among those who have been killed. In the information his mother gave to the War Graves Commission, she says he was killed in action. The announcement of his death in The Times on 16 April says "accidentally killed whilst flying abroad". Strangely, little has been written about George Stoddart who sounds to have been quite a character. Born George Benjamin Johnstone, the name Stoddart was added after his mother remarried in 1909. Johnstone's father died in 1903 in the London County Asylum. His widow, Rosa, went to work in the Bethlem Royal Hospital Lunatic Asylum. Here she met and married the psychiatrist Dr William Henry Butters Stoddart. In 1911, George, his mother and his two sisters were all living with their step-father at the asylum. AGE 17 YRS. 1 MON. 10 DYS. On Harold Maitland Goring's attestation papers his date of birth is clearly given as 9 September 1898, but he was lying, Harold Goring was born on 9 September 1900. This must be why his mother was so specific on his headstone inscription stating his age as exactly 17 years, one month and 10 days. This made him 16 when he enlisted in January 1917, and still 16 went he went overseas on 23 March 1917. He served with the 4th Division Ammunition Column of the Canadian Field Artillery and was killed outright by a German bomb dropped on the parade ground just as the men had been dismissed. Harold Smith was 18 and 6 months when he died of wounds in an assault on the Turkish positions at Gaba Tepe in Gallipoli. This means that he can only have been 17 when he enlisted and embarked on board HMAT Geelong from Hobart on 20 October 1914. I'm pretty sure that Harold assumed the surname Smith and that he was actually Harold Consort Battenburg Street, born in Mathinna, Tasmania to David Charles and Mary Eliza Ellen Street, who are listed as his parents in the War Graves Commission records. Harold 'Smith' was underage when he enlisted and underage when he went overseas. His alias makes me wonder whether his parents knew what he was doing. Their epitaph, confirmed by his mother, certainly grants him posthumous approval. When I first read this inscription I assumed it was a bereaved wife assuring her husband that she would always be waiting for him and their reunion. But it isn't, it's from a bereaved mother and father for their only child. Clarence George Topper was 17 when he died of tetanus in hospital in Mudros Bay on the island of Lemnos. At 17 he was technically too young to be serving at the front and maybe he wasn't. When the Army realised you were underage, if they ever did, they either sent you home or used you behind the lines. Mudros Bay was a huge allied camp off the coast of Gallipoli and Topper could have been working there when a simple scratch gave him tetanus. He could equally as easily have been injured in the fighting on Gallipoli and got tetanus that way. One hundred and twelve years after Michael Dwyer arrived in Australia having been deported from Ireland by the British as a nationalist rebel, his seventeen-year-old, Australian, great-grand nephew, Gerald Heavey, was killed in France fighting for the British. A hundred and twelve years is time enough to forget old scores but his parents made a point of recording the connection on their son's headstone. Yet all the evidence points to their son being keen to fight. Australia did not have conscription so he was a volunteer. However, at the age of 17 he was too young to have joined up, too young to be serving in France let alone too young to die.